Now that’s what we call believing in your product. Now that Frankfurt is only a few days away, most display cars should be getting delivered right about now with the gentlest of care. 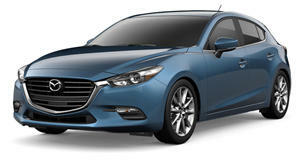 That wasn’t going to be enough for the folks at Mazda, at least not for their all new Mazda3 hatchbacks. They recently arrived in Frankfurt this week after a 9,300 mile trek that began in Hiroshima, Japan. The cars were shipped to Russia’s Far East, where they drove through five countries, and 30 cities. The cars encountered less than optimal roads in challenging environments such as lakes, mountains and cities like Moscow, Minsk, Warsaw and Berlin. However, one of the most difficult obstacles of the tour, in which the driven portion began August 3rd, has been the bureaucracy from border patrols. Two of the cars are still being held up in Poland. Mazda wants to demonstrate the confidence it has in its new Mazda3 model by having these cars travel many miles in harsh conditions to be some of the actual display cars at the 2013 Frankfurt Auto Show.